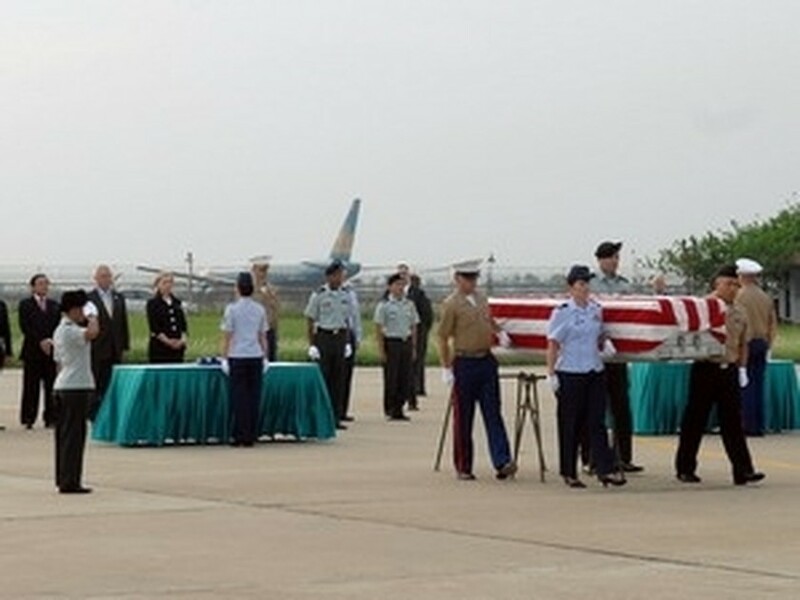 A repatriation ceremony for remains of US servicemen who died during the war in Vietnam was held at the Noi Bai International Airport on July 23. Representatives from the Vietnam Office for Seeking Missing Personnel (VNOSMP), US Secretary of State Hillary Clinton, US Ambassador to Vietnam Michael Michalak and representatives from the Joint POW/MIA Accounting Command (JPAC) attended the function. The Vietnamese government representative handed over to the US government representative three boxes of remains which were recovered during the 99 th Joint Field Activities from May to July 2010 and turned over by Vietnamese citizens. Those remains were jointly reviewed by Vietnam and US forensic specialists who concluded they might be associated with US servicemen missing during the war in Vietnam and it was recommended that the remains be brought to Hawaii for further review. Addressing the ceremony, the US government representative expressed deep gratitude and high appreciation for the steadfast humanitarian policy, good-will and the increasingly efficient cooperation of the Vietnamese government and people. This is the 115 th hand-over of American missing servicemen’s remains since 1973.